"The Space Thing" is the 87th Mandrake Sunday story. The story was written by Lee Falk and drawn by Phil Davis. Crispus Tau, a star 12 light years from Earth. A galactic watch operated by mind waves, think of any planet and it will show the correct time. If Mandrake press the alarm, a signal reaches Magnon. The Galactic Medal of Honor. 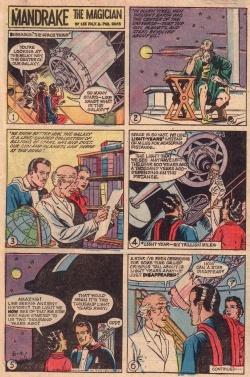 The story title is taken from the strip of June 4, 1961 (Beginning: "The Space Thing"). The strip of August 8 is the first strip with the new Sunday strip layout, which made it possible to print Mandrake Sunday strips also as a third page. This page was last edited on 6 March 2018, at 20:23.